Two years ago, I wrote this entry in this blog about going to college and what program I was trying to get into. Time sure goes by quite fast, and now I finally got into the program of my choice: Health Information Technology (HITT) at Houston Community College - Coleman College for Health Sciences. Prior to getting into the program, I busted my behind, taking basic courses, and some courses I actually didn't even have to take. At one point, my GPA was as high as 3.85 (out of 4.0). That was my GPA during my interview to get accepted into the program, but after getting hit with a B in Anatomy & Physiology, my GPA dropped a bit to 3.75. Being in a program is a totally different ballgame. I am considering going to school full-time just to get my diploma early. I can see myself working from home within the next 5 years, even less than that! But first, I got to adjust to the type of student my professor wants me to be: very, very, VERY dedicated and disciplined. While that is not usually a problem, I am experiencing some financial difficulties at the moment, which I may mention later on in this blog. I am proud of my accomplishments as a college student, especially since I didn't think I was going to end up going to college at my mid-thirties. I was a terrible student in high school, with a GPA that falls very low within the lowest quartile. Even then, I desired to finish high school with a diploma, and I obtained it through Houston Community College's Adult High School program back in 1999 and 2000. Now that I am in college, it seems like I am living the student life I should have had when I was in high school. This maybe a half-way point of my college career, or maybe not. I will try to go as far as I can. I've been in college for two years, but this semester, is really, only the beginning of my actual college life. Personally, I am not as much of a gamer as many would consider gamers to actually be. I'm certainly not an expert, enough to write reviews about them. At some point in my life, I felt like I grew up, and video games were no longer for me. But that only made me feel like a big part of me died. 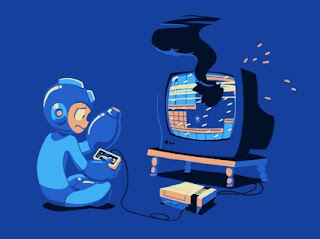 From time to time, I would catch myself downloading ROMs and console emulators to play old video games. It helps with killing time, and I happen to be a sucker for nostalgia. I considered myself to be a classic gamer, since I enjoy playing 8-bit and 16-bit games. I'm also into RPG games, like Final Fantasy, but I mainly stick to the non-Final Fantasy games like Chrono Trigger, Secret of Mana, and Xenogears. At this day in age, I failed to realize that there is a new way to play video games with friends. I knew about it, but I didn't even care to delve deeper into it. The world of MMORPG came, and I felt very, very left behind. I made a few attempts to get into it, but games like World of Warcraft, Starcraft, or whatever-craft didn't really appeal to my taste in gaming. I am way too into the whole side-scrolling, beat 'em up, earn EXP, talk to NPCs kinda guy. At some point in my life, most of my friends had some sort of IGN, or "In Game Name" from whatever game they were playing. I didn't, but it didn't really bother me... not too much. Okay, maybe, sorta. Are you looking for a way to retrieve your Houston Community College Student WebMail from your Android's email app? Or maybe you're looking for a way to get notified via your mobile phone when you receive emails in your student email? I know I was! I am writing this blog post to share the information I discovered and learned regarding ways to retrieve, send, sync calendar events, and get push notifications when receiving emails in your Houston Community College Student E-mail using your Android's stock e-mail app. I haven't even started my first day as a college student yet, and I certainly don't want to miss any correspondence from my professors and classmates. Before I start, I would like to mention that I wouldn't have been able to write this post if not for the following blog: Vango Versa: How to set up Houston Community College (HCC) Email on your iPhone Thank you! Unlike the blog post in the link above, in which she uses an iOS device, I happen to be using an Android device, the Samsung Galaxy Note 4 to be exact. I hope this works on many Android devices, though I'm sure that if the right information is entered in an iOS device, this should work just fine. If you have an iOS device like an iPhone, iPod Touch or iPad, click the link above. You should have your Student ID (w#########) memorized, or at least ready.You're going to need that, and your password. Step 1: On your Android Device, go to Settings. Step 3: Select Microsoft Exchange ActiveSync. 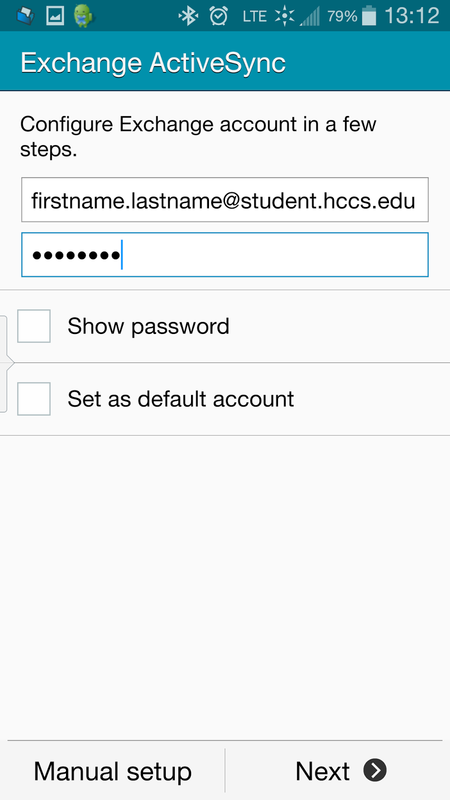 Step 4: Under the e-mail field, go ahead and enter your HCCS student email address. This should be in the firstname.lastname@student.hccs.edu format. Step 5: Then on the password field, enter your password. Optional: Click Manual setup. Any information you may need will still be in the following steps. I haven't tried this yet, but I will update this post once I know more.